Snowshoe Thompson (April 30, 1827 – May 15, 1876) was the nickname for the Norwegian-American John A. Thompson. He was undoubtedly one the best mountaineers to ever ski through Tahoe. Despite his nickname, he did not use snowshoes as we think of them today. Instead he used ten-foot (over 3-meter) skis, and a single sturdy pole held in both hands. His version of cross-country skiing came from his native Scandinavia. In fact, he was one of the first to introduce cross country skiing to the U.S.
Thompson delivered the first silver ore to be mined from the Comstock Lode. Later he taught others how to make skis, as well as the basics of their use. Despite his twenty years of service, he was never paid for delivering the mail. Snowshoe truly set the bar for delivering the mail under any condition. Read about his dedication in the following story by local historian Don Lane. Of all the people that have lived in our mountains, the one person that truly became a legend during his lifetime was a man who only lived to be 49, but a man that was adventurous, fearless and the best mountaineer to ever ski through the Tahoe Basin. His name was John A. Thompson. 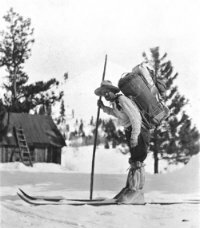 It was during the winter of 1856, when he was 29-years old, when Thompson heard that the mail wasn’t getting through the Sierras during the winter because of the snowstorms, and he recalled that during his childhood days in Norway, they used these long, heavy skis, they called “snowshoes,” to get around the mountains. So he fashioned a pair out of green oak, and although they were over 10 feet long, and weighed about twenty-five pounds, he knew they’d get him over the snow. So he declared himself ready to carry the mail across the mountains, and headed off from Placerville to Carson Valley and back again the rest of that winter … and for the next 20 winters. Through blizzards, frigid winds, and through whiteout conditions, Thompson carried the mail. The weight of the bags usually ranged between sixty to eighty pounds, but one winter his load often averaged over 100 pounds. He never carried blankets, nor did he even wear an overcoat, depending on exercise to keep him warm. For water, he grabbed a handful of snow, and his food consisted of only some dried sausage, and a few crackers or biscuits. By the day, he was guided by the trees and the rocks, for Thompson was a student of the mountains. He had a sixth sense about where he was, and never got lost, never. During the night, he looked up to the stars, like a mariner and sailed through the Sierras, sliding over the drifts with his long wood snowshoes, and pushing himself along with a single wood pole. Once near Hope Valley, he ran into a pack of six hungry wolves who were ripping at the carcass of some animal. They started after him, but when he simply stared them down and kept on skiing, they stopped cold in their tracks and let him go his way. On another day, Thompson ran into fresh tracks of grizzly bears, but he was never harmed in twenty years. But although Thompson braved the meanest winters Tahoe ever saw, and faced down occasional wolves never missing a trip, he couldn’t overcome the inertia of government, when he sought to obtain a small pension for his 20-years of services, services that he had provided for free to the residents of Tahoe and Carson Valley, the sum of $6000. Although everyone seemed to support his request, he never received one red cent. But when John A. Thompson died of a liver ailment in Genoa in 1876, he was loved and respected by every resident in the Sierras, and would be known forever as “Snowshoe Thompson,” a Sierra legend.